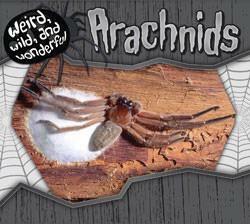 Arachnids are a special group of animals that includes spiders, scorpions, ticks, and mites. This attention-grabbing book takes a close look at some of these amazing creatures. Their poisonous fangs help them catch prey and defend themselves. Their complex webs and nets catch food and keep their eggs safe. These are just some of the weird, wild, and wonderful ways that arachnids survive in the wild.